I love tea and scones so when a friend invited me to join in for a birthday celebration at an Alice in Wonderland themed tea party, my answer was a very quick YES! 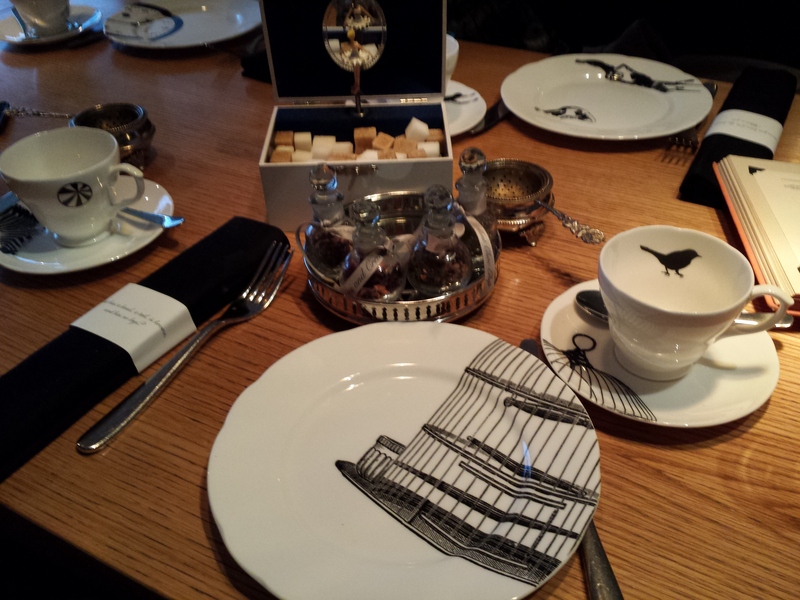 Here are some snapshots from the lovely Mad Hatter’s Afternoon Tea at the Sanderson Hotel in London’s West End. 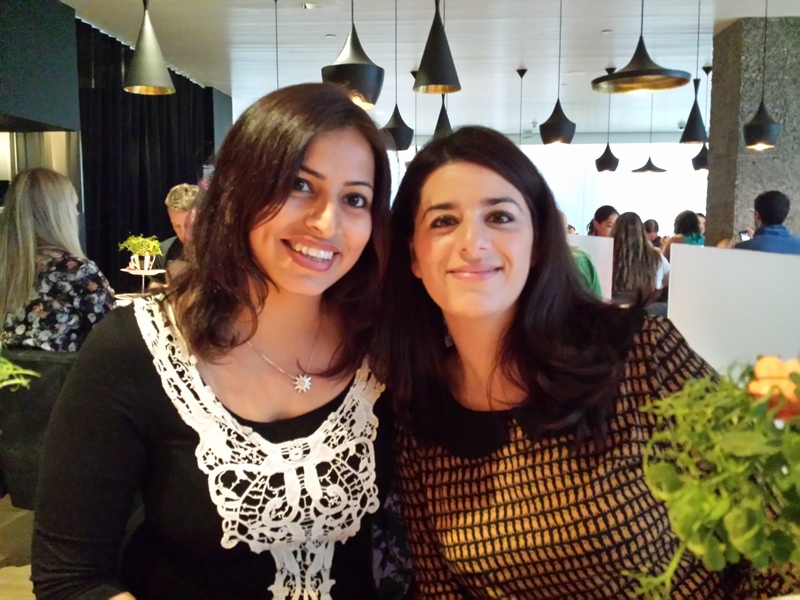 The gorgeous birthday girl and I – excited for afternoon tea in wonderland! 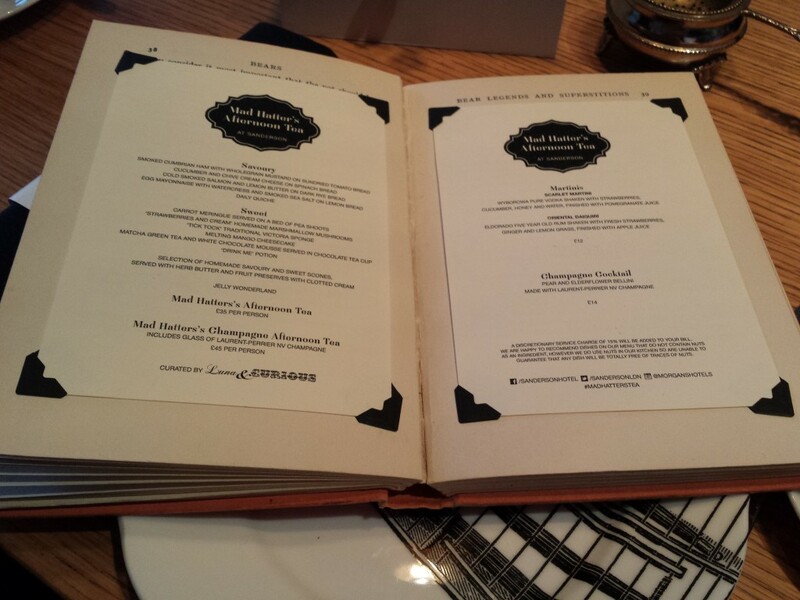 The Mad Hatter’s Afternoon Tea menu comes hidden inside a vintage book. 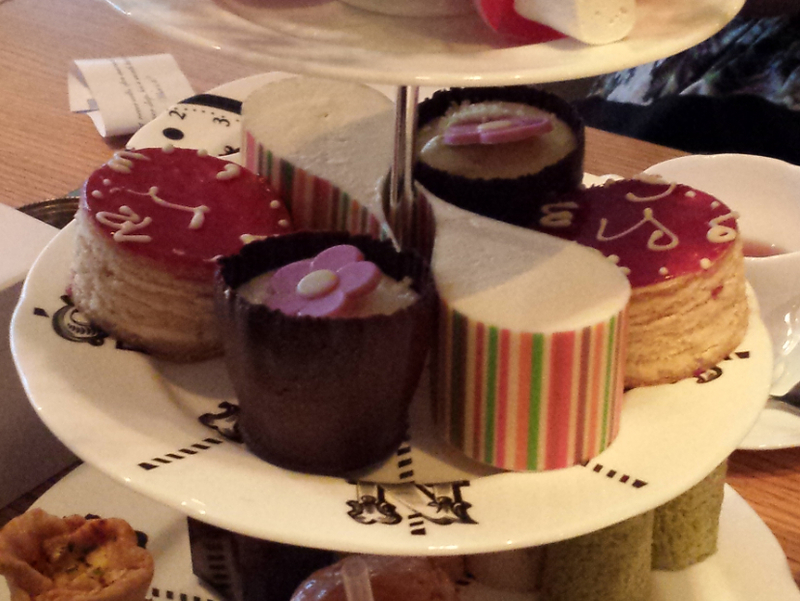 One can choose between the regular Mad Hatter’s Tea at £35/person or the Champagne Afternoon Tea at £45/person. 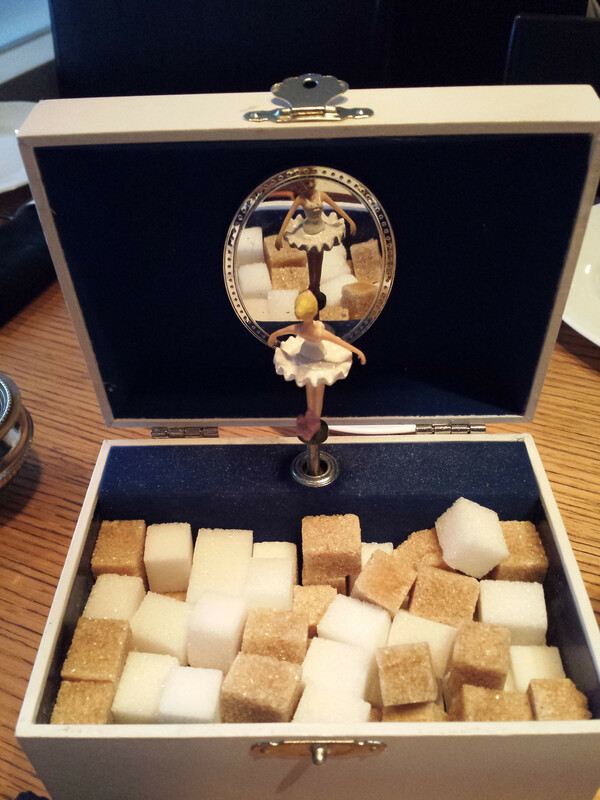 Each table has a musical jewellery box containing a twirling ballerina and sugar cubes. I was in awe of the gorgeous, bespoke china specially designed by Luna & Curious, a design collective based out of Shoreditch. The napkins are wrapped with a riddle, fitting perfectly with the Alice in Wonderland theme. The special tea choice for the Mad Hatter’s Tea Party included Strawberries & Cream, Rhubarb & Custard, Mint Choco Chip & Apple Pie. 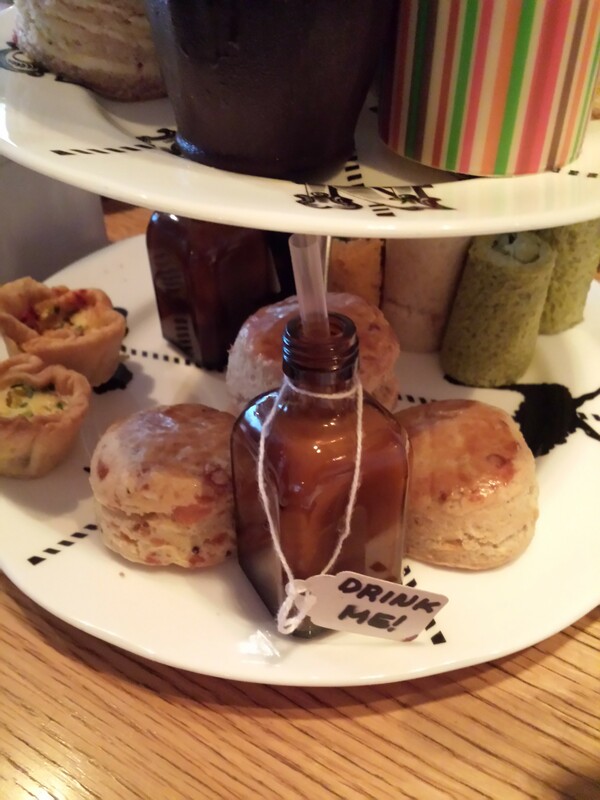 The loose leaf teas are displayed in small, glass bottles decorated with a simple satin ribbon. Of course, one can also call for Earl Grey, English Breakfast, coffee…whatever you fancy. 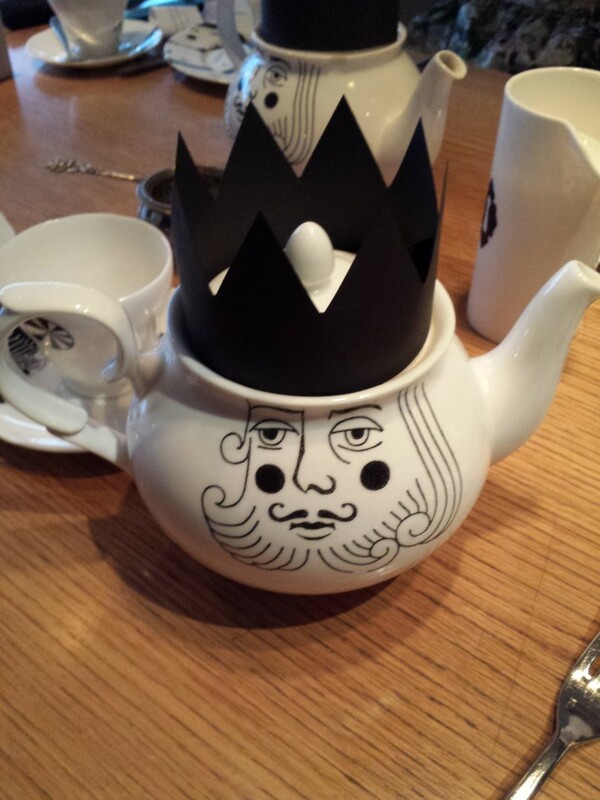 The tea is served in individual tea pots adorned with kings and queens – also designed by Luna and Curious. The gorgeous cake stand arrives with unique, creative and the most decadent, sweet and savoury treats. Definite wow moment. 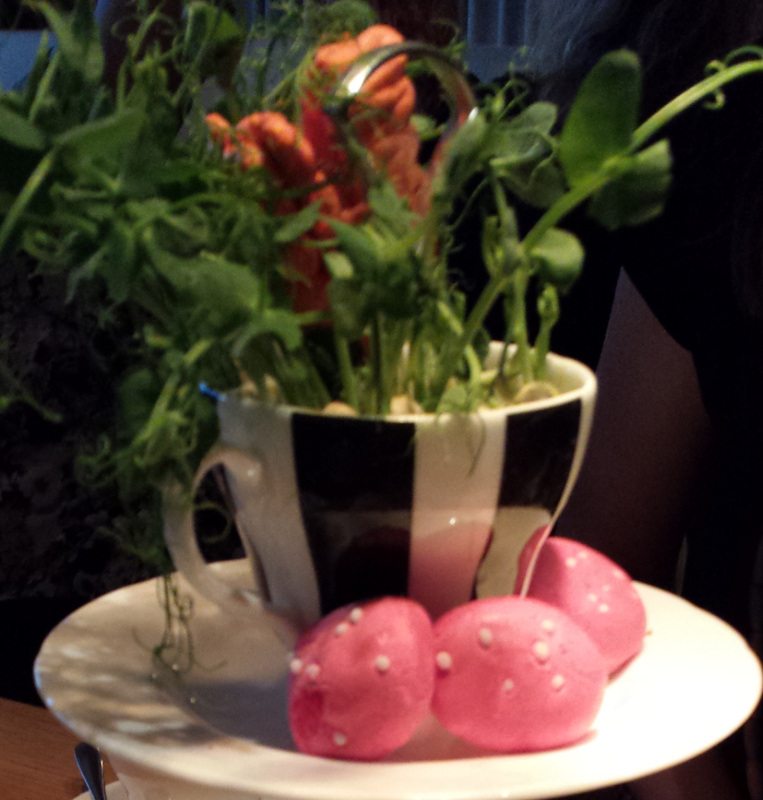 The top layer: Sweet carrot meringues served on a bed of pea shoots and mushroom-shaped marshmallows flavoured with strawberries and cream! Lovely. The middle layer: Tick Tock Traditional Victoria Sponge (layers of strawberry jam, vanilla crème and thin sponge iced with a fabulous clock design on top) Matcha Green Tea and White Chocolate Mousse served in a chocolate tea-cup & Melting Mango Cheesecake (teardrop shaped creamy cheesecake with a gooey yolk of mango purée hidden inside. Super sweet and extremely indulgent. Bottom layer: Drink Me Potion (tiny bottle filled with sweet, fruity layers of passion fruit, coconut and banana purée), Quiche and a selection of delicious and uniquely rolled finger sandwiches including Smoked Cumbrian Ham, Cucumber/Chives/Cream Cheese & Egg Mayonnaise with Cress. And of course, sweet and savoury scones served with herb butter, clotted cream & jam. What a treat! 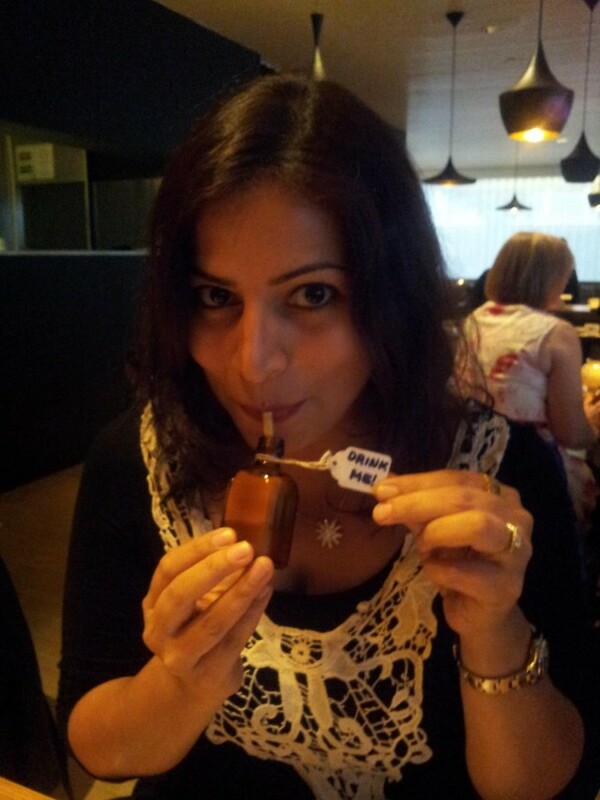 Here’s me sipping the magical Drink Me potion, feeling very much like Alice in Wonderland….and praying I don’t shrink!! Looking through these photos, I can’t help but wish I had done a better job with the lavish spread placed before my eyes. 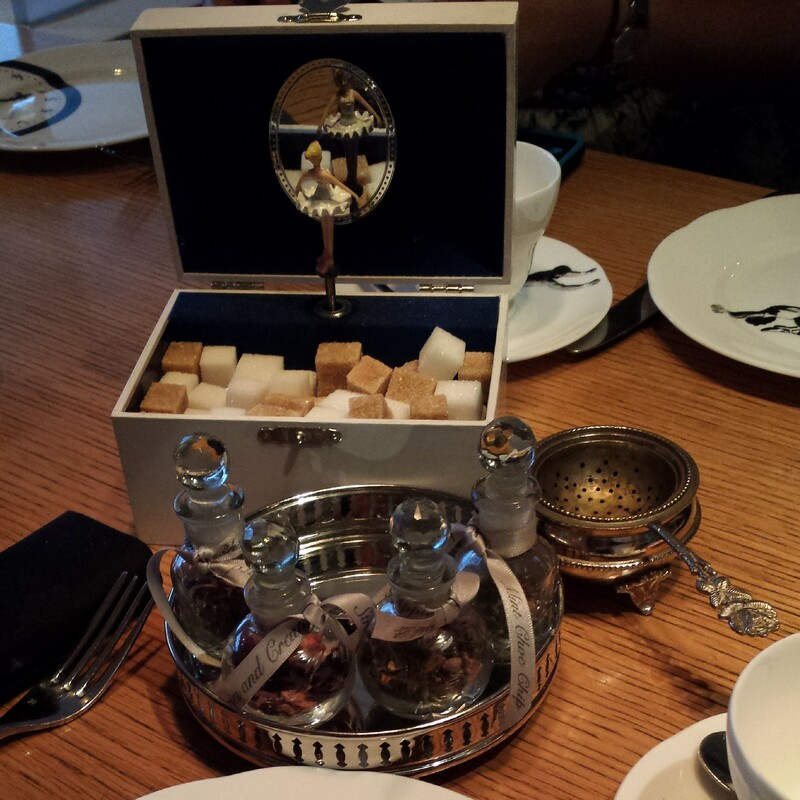 The afternoon tea was a visual and gastronomic treat and the experience was truly unique and memorable. 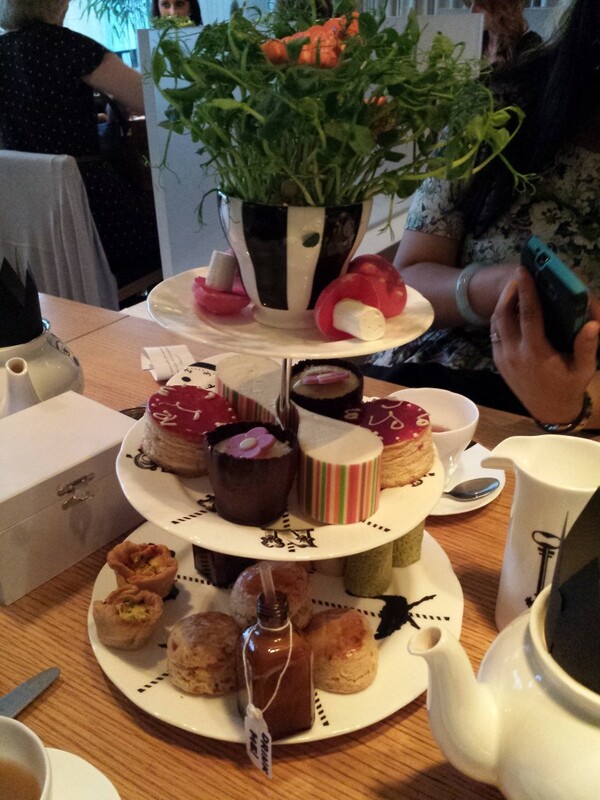 The Mad Hatter’s Afternoon Tea is a lovely way to spend the afternoon and I highly recommend it for a special occasion or an extremely indulgent tea break! Make sure you arrive hungry and be ready to roll out of the Sanderson Hotel in a food coma. wow Reema, looks amazing. I adore the crockery and the cakes look divine! Reeshma it was amazing! The crockery set retails for £400 on the Luna & Curious website – I am tempted! What a lavish spread for afternoon tea! I am sure you must have enjoyed with your lovely friend Hina! Haha yes, it was lavish indeed! We had a great time!